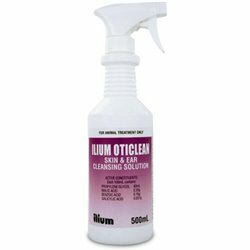 Ear Care There are 3 products. 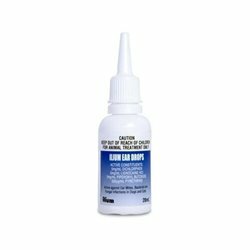 For treatment of Ear mites and bacterial and fungal ear infections in dogs and cats. Indications: May aid the treatment of otitis externa, cleanses wounds and abrasions when healing,removes debris or wax out of ears in horses, dogs and cats. 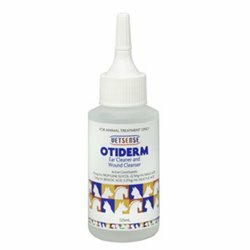 Otiderm Ear Cleaner and Wound Cleansing Solution is for use in the removal of accumulated wax deposits and as an adjunct in the treatment of otitis externa. It can also be used as an aid in the removal of necrotic tissue, coagulum and debris from wounds in horses, dogs and cats.